Section control is a feature often associated with sprayers or seed drills, offering increased application accuracy and greater efficiency. And now Joskin is applying the technology to its slurry tankers. In a nut shell, section control uses GPS signals to automatically open and close sections of a machine (boom, spread pattern, coulters, for example), to automatically manage the spreading/application widths according to where the machine is in the field. The result is fewer misses and overlaps, particularly at headlands which are on angles to bouts. 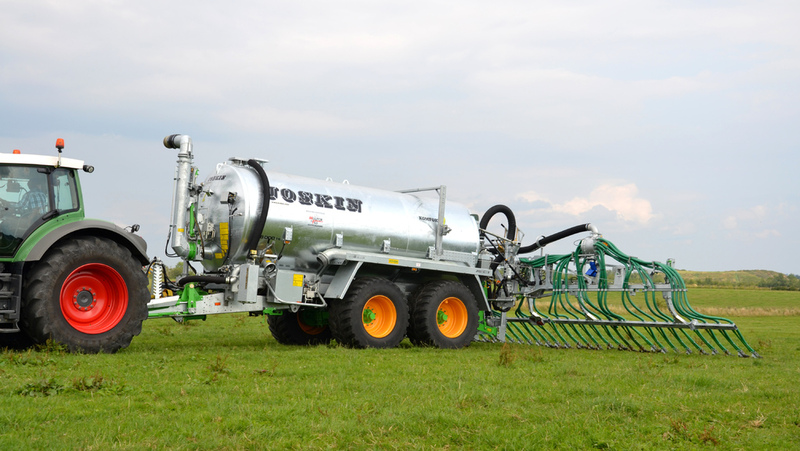 For chemical and fertiliser application, the manufacturer says this technology can offer substantial cost savings, especially when you consider you can make the most of existing resources such as slurry. Another benefit is the prevention of over application and subsequent damage to the environment. It also allows users to accurately document work done – useful for NVZ documents and slurry management, for example. Joskin says it is thanks to machine IsoBus control that section control is possible, which it has been fitting to machines already for several years. Now, as well as controlling the tanker’s features, the control technology has been extended to section control of dribble bars, trailing shoes and injectors. To implement this technology, Joskin uses section control to manage the individual spreading lines of its tools by controlling hydraulic or pneumatic pincers which close the hoses per sections. For example, 12 sections on a Joskin Pendislide trailing shoe boom of 12 metres. Each section of pincers is controlled by an individual electro-valve and the outer sections of each side can be limited to one single element (one single hose in the case of a Pendislide) in order to guarantee a control as precise as the precision level of the GPS, says the manufacturer. For example, the outer hose will stop being fed if the driver gets too close from the last row of the previous bout. The timing of the opening and closing process can be configured by the operator in order to avoid excessive misses and overlaps between two adjacent bouts. In order to keep the desired application volume, the IsoBus control box notices pressure and flow differences resulting from the section breaking and accordingly controls the main feeding valve of the macerator. Section control technology will be available for all the firm’s dribble bar, trailing shoe and injector applicators. Previous Article Road test: Are the latest updates to the Shogun enough?